Drupa 2016, an 11 days endeavour where Stallion was amongst the 1837 exhibitors from all over the world. Stallion launched its online padding line comprising of M-30STITCHmaster+TAPEmaster (Programmable Heavy Duty Wire Stitching & Spine Taping Machine): Our Online solution for Stationery line. M-30STITCHmaster which can stitch upto30mm is made with Technical collaboration between Deluxe Stitcher International, USA and Stallion Innovative Machines, India. TAPEmaster, the patented technology is capable of taping any kinds of spines with complete finishing. Both these machines can be operated individually offline as well.Also on display was Stallion PINmaster,Wire stitching machine. Can stitch upto 8mm thick book using Deluxe/HohnerStitcher heads. With the machines providing live demos all 11 days, attracted a lot of visitors. With a huge database of potential customers our work has just begun, to open ourselves to the international market.Stallion is amongst the few to provide automatic solutions for post press industries all over the world. Our main aim is to focus on automation, reducing the number of workers & increasing the production. Stallion has 9 state of the art machines with a record of inventing one machine every year. Stallion already has around 450 installations in India & around 50 across the world. Our major breakthrough to the worldwide market before Drupa was because of our tie-up with Ireland based agent Pro-Bindery, who were also present at Stallion stall during Drupa. 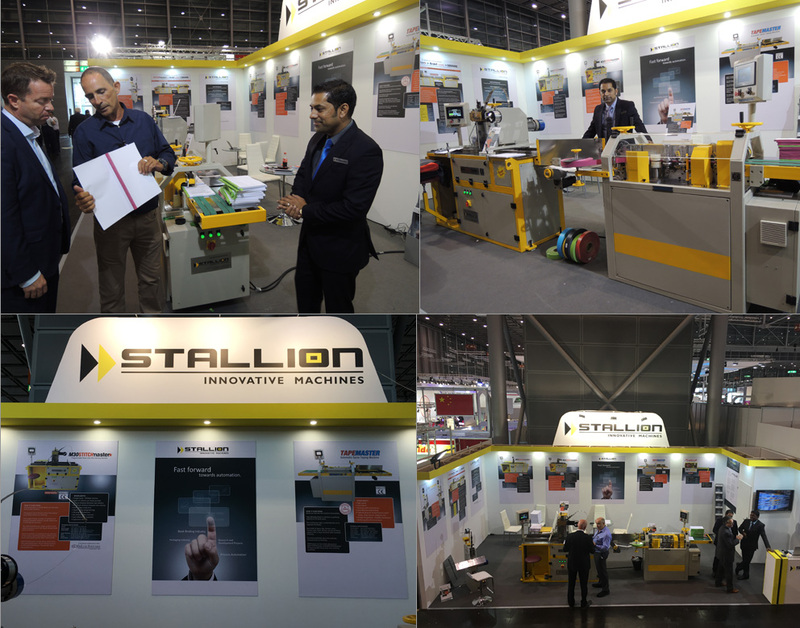 Stallion wishes to increase its international installations as Drupa provided us with a worldwide platform where we showcased our products which have be acknowledged and appreciated by everyone. Stallion machines are now in competition to European machines where we provide the same quality and speed at an economical value. Though Drupa will help us gain oversea orders we will never neglect our Indian customers, as these are the ones who encouraged us to gain the name & fame to reach a point where we could now have a stall at Drupa. We will henceforth make a presence at all major printing & packaging exhibitions not only in India but internationally as well. With the end of Drupa our work has just began to make Stallion known in every corner of the world by having installations in every country.We want to build lifelong relationships with customers & gain their confidence in our machines.